Sir Granville Ransome Bantock (7 August 1868 – 16 October 1946) was a British composer of classical music. Granville Bantock was born in London. His father was an eminent Scottish surgeon. His younger brother was the dramatist and film director Leedham Bantock. 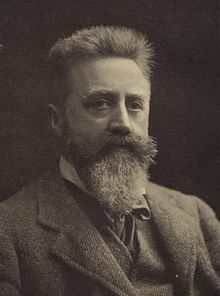 Granville Bantock was intended by his parents for the Indian Civil Service but he suffered poor health and initially turned to chemical engineering. At the age of 20, when he began studying composers' manuscripts, at South Kensington Museum Library, he was drawn into the musical world. His first teacher was Dr Gordon Saunders at Trinity College of Music. In 1888 he entered the Royal Academy of Music where he studied harmony and composition with Frederick Corder winning the Macfarren Prize in the first year it was awarded. Early conducting engagements took him around the world with a musical comedy troupe. With his brother Leedham Bantock he wrote a couple of music hall songs which met with some success. He founded a music magazine, The New Quarterly Music Review, but this lasted only a few years. In 1897, he became conductor at the New Brighton Tower concerts, where he promoted the works of Joseph Holbrooke, Frederic Hymen Cowen, Charles Steggall, Edward German, Hubert Parry, Charles Villiers Stanford, Corder and others, frequently devoting whole concerts to a single composer. He was also conductor of the Liverpool Orchestral Society with which he premiered Delius's Brigg Fair on 18 January 1908. He became the principal of the Birmingham and Midland Institute school of music in 1900. He was a close friend of fellow composer Havergal Brian. He was Peyton Professor of Music at the University of Birmingham from 1908 to 1934 (in which post he succeeded Sir Edward Elgar). In 1934, he was elected Chairman of the Corporation of Trinity College of Music in London. He was knighted in 1930. His students included the conductor and composer Anthony Bernard and the composer Eric Fogg. In 1898 he married Helena von Schweitzer (1868-1961) who acted as a librettist for him. He was influential in the founding of the City of Birmingham orchestra (later the City of Birmingham Symphony Orchestra), whose first performance in September 1920 was of his overture Saul. Bantock's Hebridean Symphony was recorded by the CBO on 28 January 1925 at Riley Hall, Constitution Hill, Birmingham. This acoustic version, conducted by Adrian Boult, was never released. His music was influenced by folk song of the Hebrides (as in his 1915 Hebridean Symphony) and the works of Richard Wagner. Many of his works have an "exotic" element, including the choral epic Omar Khayyám (1906–09). Among his other better-known works are the overture The Pierrot of the Minute (1908) and the Pagan Symphony (1928). Many of his works have been commercially recorded since the early 1990s. Shortly after the composer's death in London, in 1946, a Bantock Society was established. Its first president was Jean Sibelius, whose music Bantock championed during the early years of the century. Sibelius dedicated his Third Symphony to Bantock. Edward Elgar dedicated the second of his Pomp and Circumstance Marches to Bantock. Granville Bantock is the father-in-law of the composer Margaret More (1903-1966) via her marriage to Granville's son, Raymond Bantock. Three books have been published on Granville Bantock. The first was authored by his long-time (and long suffering) friend and 'secretary', 'Colonel' H. O. Anderton for the Living Masters of Music series in 1915. It is a very dry but useful book. The second is a 'personal portrait' by Bantock's daughter, published by Dent in 1972. It is an engaging read and contains a number of photographs. The third, An Introduction to the Life and Work of Sir Granville Bantock by Vincent Budd, was published in 2000, by Gnosis Press. It is also illustrated and contains a discographical guide. A larger volume is in progress. The Bantock Society published a Journal between 1996 and 1999 and its issues contain a number of useful articles on the composer. There are also numerous other published pieces scattered in various magazines and journals. A Doctoral thesis by Trevor Bray, written in 1972, is very useful as a record of Bantock's musical output. A collection of the composer's letters to Muriel Mann, with whom he had an affair between 1936 and 1940, was published in May 2013 by her granddaughter Katherine de Marne Werner, with the title "My Dear Rogue". This contains prefaces by two of GB's grandchildren and a long Afterword by Vincent Budd which helps to put these letters in to historical perspective and includes previously unpublished material. A broad selection of Bantock's orchestral output, including all the symphonies, has been recorded in an edition by the Hyperion label in performances with the Royal Philharmonic Orchestra conducted by Vernon Handley, now available also as a box set. Handley also recorded a largely complete performance of Omar Khayyám with the BBC Symphony Orchestra and Chorus on the Chandos label. However, the only complete recording is available on the Lyrita Recorded Edition label. An alternative recording of the Hebridean Symphony (together with the Old English Suite and Russian Scenes) is available on the Naxos label, with the Czechoslovak Philharmonic Orchestra (Kosice) conducted by Adrian Leaper. Historic recordings of miniatures and songs have appeared on the Dutton label. The Cameo Classics label has re-issued its Granville Bantock recordings made with conductor Geoffrey Heald-Smith from 1978 to 1982 on a double CD set, which includes the Hebridean Symphony (in the presence of Raymond Bantock), the Pagan Symphony and Witch of Atlas (the first digital recordings), and the Sapphic Poem (solo cello, Gillian Thoday). A selective list of his compositions is to be found in Grove 5. ^ a b c d e f Anderson, Keith (2001). Granville Bantock (1868-1946): Old English Suite; Russian Scenes; Hebridean Symphony (slevenotes), Naxos. Retrieved 2011-07-16. ^ Budd, Vincent (2004, rev 2009). Bantock, Sir Granville Ransome (1868–1946). Oxford Dictionary of National Biography, Oxford University Press. Retrieved 2011-07-15. ^ A Reason for Resignation. The University of Birmingham Newsletter, Issue 21 Vol 2 February 2003. Retrieved 2011-07-16. ^ Foreman, Lewis (2007), Bantock: Omar Khayyám Archived 21 March 2012 at the Wayback Machine (PDF), Chandos Records. Retrieved 2011-06-27. ^ Foreman, Lewis (2003). Sir Granville Bantock (1868-1946) The Song of Songs (sleeve notes). Hyperion Records. Retrieved 2011-07-16. ^ "Rediscover Bantock with first recordings of 'hidden' music - Trinity Laban". Trinitylaban.ac.uk. Retrieved 16 February 2019. ^ "A feast of lanterns [music]". Nla.gov.au. Retrieved 16 February 2019. Sir Granville Bantock a new (2017) website (replacing the Bantock Society website which no longer exists). Aims to link to musical sources, published music and recordings and concert performances of works by Sir Granville Bantock. "Archival material relating to Granville Bantock". UK National Archives.